Something for every rider This is probably the most common and fun riding activity. There is something for every rider, from beginner to the advanced. Horse shows are about competition, showing how good a horse person you are and winning ribbons. Competing successfully means lots of training and practice, which costs lots of money. Pleasure classes: these are not judged on the rider's ability, but much weight is given to the performance of the horse - "how pleasureable" is the horse to ride. There are pleasure classes in both English and Western styles. Equitation classes: here the rider is judged on her riding skills. The rider must give commands effectively to her horse. The horse must respond smoothly. Dressage belongs to this class. Timed classes: Western riding will have games such as pole bending and barrel racing. English riders will do stadium jumping and cross country. Style is very important in all classes. There is also sometimes a showmanship class, standing alongside your horse, you walk it through a pattern that is posted about one hour before the show. You demonstrate leading, backing, and turning around. Local shows are the best place for beginners, and a good place to build your confidence. If you consistently place well, then consider competing at the state and national level. It is harder to place well in these shows not only because of the demands of superior skill, but there are a greater number of riders competing. It is a thrill to compete at any level. There are usually three classes in Western division riding competition. In the stock horse section, the rider demonstrates their horse's paces at the walk, jog (trot), and lope (cantor). The reining-back test shows how quickly the horse can come to a halt from full speed. Several competitions involve working with cattle. And of course their are the timed events mentioned above. The competitors in a three-day event complete 3 different tests - dressage, speed & endurance, and show jumping, each on a different day. 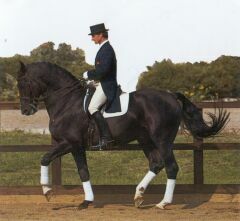 Dressage requires competitors to perform a test comprising about 15 different movements, marked by a panell of 3 judges. Marks are awarded for each movement including paces, submission, and seat of the rider. Speed and endurance are usually divided into 4 phases, over a cross country distance of 6 to 12 miles, and may include a steeplechase. The last event is show-jumping. This comprises a course of up to 12 fences. All events are timed, and you lose points if the horse knocks over any fences, refuses a jump, or the rider falls. Read the next horse show informational article on Organizing a Community Horse Show.